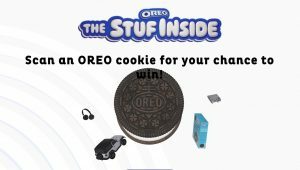 OREO fans have to Scan an OREO Cookie for a Chance to win prizes including : trip for two (2) to New York City, New York, An all-new 2018 2-door OREO customized Jeep Wrangler with Sport trim, OREO Cookie Jar, headphones and more! SWEEPSTAKES: One (1) Grand Prize: A trip for two (2) to New York City, New York. Trip package includes round trip, coach-class air transportation for winner and one (1) guest from a major airport near winner’s home to one (1) of the major airports that services the New York City, New York area (departure and arrival airports determined by Sponsor in its sole discretion); two (2) nights’ accommodations at a hotel determined by Sponsor in its sole discretion (single room, double occupancy); roundtrip ground transportation between destination airport/hotel (with transportation company determined by Sponsor in its sole discretion); two (2) tickets to the Broadway production Waitress; a gift bag; and $900 USD in spending money for winner only.ARV: $3,900.00 USD.